TORONTO — A number of Canada’s medical marijuana growers are poised to release cannabis oils for authorized patients who don’t want to smoke or vaporize the dried herb to relieve symptoms. In July, Health Canada gave growers the green light to begin producing the plant-based extracts, which are expected to be approved for sale in the coming months. About a dozen of the country’s 25 medicinal pot producers have sought expanded licences to produce and market cannabis oils and/or fresh marijuana buds and leaves under the updated federal regulations. Among them are Ontario companies Tweed and Bedrocan Canada Inc., and B.C.’s Tilray. 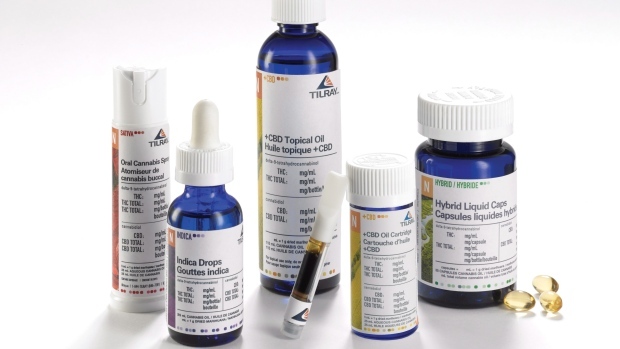 Tilray announced Monday that it has 20 cannabis extract products awaiting Health Canada approval, including oils in liquid form, gel caps and a topical preparation for certain skin conditions. “We really felt it was important to let patients and the general public, physicians and researchers know about these products ahead of time,” said Philippe Lucas, the company’s vice-president of research and services. “We know there’s going to be a lot of questions about the products the first time that these kinds of extract products will be legally available in Canada,” he said from Nanaimo, B.C. Patients who have been authorized by their doctors to purchase dried medical marijuana to treat such conditions as chronic pain, multiple sclerosis symptoms or epilepsy will not need a new prescription in order to access cannabis oils, he said. “There’s an equivalency factor that we’ve put into these and so there will be an equivalency, for example, of the number of gel caps or the amount of oil you’re allowed to order, based on your daily and monthly limits. “So any Canadian who’s authorized to use medical cannabis right now would be able to access these,” said Lucas, noting that the oils will be delivered by mail or courier in the same way the dried herb is currently shipped. Bruce Linton, chairman and CEO of the recently merged Bedrocan and Tweed, said the company initially plans to release two or three cannabis oil products, which could be scaled up to 10 or more, depending on patient demand. For instance, an oil could include a combination of marijuana strains, while another could be a purified single strain with a specific effect, such as helping a person with chronic pain to sleep. “So each of the venues has their own distinct strains, which have their own distinct applications and will become their own distinct oils,” he said of the Bedrocan and Tweed growing facilities. As well, some oils produced by the various growers will have different concentrations of weed’s main medicinal ingredients: THC (tetrahydrocannabinol), the psychoactive agent that provides marijuana’s high, and non-psychoactive CBD (cannabidiol), which is being used by some patients to control seizures. A Health Canada spokesman said Monday that the various producers’ oils will be approved on a case-by-case basis.